HYDE PARK, Vt. -- He came bearing bad news to a town set for solar. "We have to abandon the project," said Dave Hallquist, CEO of the Vermont Electric Cooperative. South Hero pledged support for a 15-acre, 1.5-megawatt solar project. But now VEC can't do it. A wetland at the site raised environmental concerns. Hallquist pitched another plan: a bigger, 50-acre project in a different location. VEC would partner with a big developer. "There are large solar developers who do a good job who can afford to take that kind of risk," he said. Hallquist is known for striking deals, a smart businessman at the forefront of innovative energy projects. He's a respected leader, pitching in when the lights go out. He's also the town moderator in Hyde Park. And now he wants to be known as someone else. "Christine Hallquist is who I really am," he said. Dave Hallquist is transgender-- basically born with a male body and a female mind. "I would never want to go to my grave knowing I didn't tell the world about this," he said. CBS affiliate WCAX in Vermont is sharing Hallquist's story. Dave says the need to finally live the truth stems from a dark place, a place of suffering. He was bullied and beaten as a child by classmates and by nuns, who he says demanded an exorcism on the eighth-grader because he was different from the other boys. "I learned early on that it would not be acceptable to be Christine," he said. To survive, he toughened up, started playing sports and hid what was happening in his head. "I learned to the play the role well and I've been playing it ever since," Dave said. It worked. He fooled everyone in high school and college. And then he met Pat, the love of his life. The pair married two years later, though Dave kept the painful secret. "She's been amazingly supportive, but I'm not the person she married," he said. Several years after the wedding, Pat discovered Dave's hidden wardrobe of women's clothing. She was confused, confronted him and considered leaving. But eventually she chalked it up to a phase or a fetish, like cross-dressing just for fun, hoping it would pass. She stayed so long as no one else knew. "We were going to keep this secret to our grave," he said. She allowed Dave to dress as Christine in private. Christine usually did so while playing the piano-- alone. Pat didn't want to see it. Then came three kids: two girls and a boy. "It's incredibly painful not to be your authentic self," Dave said. "I don't believe at all that transgender men and women have mental illness as a result of being transgender," Dr. Rachel Inker said. Inker is a medical doctor running the transgender care clinic at Burlington's Community Health Center. Three-hundred trans patients have come here over the last 10 years, people in their late teens to senior citizens. "People will often talk about years as early as childhood of feeling that they are not in the body they were intended to, that people don't see who they are," Inker said. "It can be a difficult process for people filled with loss, rejection, harassment." Counting the transgender population is challenging. The U.S. Census Bureau doesn't ask if someone is trans and the number isn't tracked by the CDC. And not everyone is out. But experts working with the trans community in Vermont estimate the population to be around 1,400. That means for every 440 people you pass on the street, one of them identifies as transgender. "There's so much shame, a lifetime of shame, lifetime of embarrassment, a lifetime of trying," Dave said. After years of hiding, even thoughts of suicide and periodic purging, tossing out his women's clothes, Dave couldn't live like that any longer. "You try and you try and you try, and at some point you realize, I can't fight this," he said. About five years ago, he told his kids. "At first there's obvious personal shock," son Derek said. "This is a person we've been around for 30 years of my life... who is completely changing into a different person and that's hard, and recognizing it's hard. But we keep coming back to the fact that we really love each other," daughter Kiersten said. The family stuck together. And Derek is documenting his father's transformation. But they all admit it's been tough and still is, especially now that Dave's transition is further along. He's taking estrogen and testosterone blockers. He's changing and going public with his new identity. On one night -- a first outing for Christine with a group of trans women she met through the advocacy group Pride Center of Vermont. There's a new outfit for the occasion, makeup, hair and jewelry. And there's a bit of fashion advice from Pat, who's working to make peace with what's happening and still support the person she's loved for so long. No nerves, just excitement for Christine during the hourlong ride from her Hyde Park home to Splash on the Burlington waterfront. "I feel happy," she said. Quickly, Christine found new friendships. Drinks turned into dinner and an invite for two of Christine's kids to join. "In fact, I prefer being out and hanging with Christine now. Because I can tell she's happy," Derek said. But their hearts go out to their mom, Pat, back at home, who's struggling with the public revelation. "We all agreed we are super worried about mom," Derek said. The whole family is in group therapy. The marriage, though, is in question. "We are very lucky in that we have had each other in this," Kiersten said. Reporter Darren Perron: What's your biggest fear in coming out publicly? Kiersten and Derek Hallquist, Christine's children. CBS affiliate WCAX. Christine Hallquist: My biggest fear now is for my wife and family and how they adjust... When you've loved and lived with someone for 35 plus years, forgive me, I'm going to cry... I love my wife dearly. Of course this is a struggle for transgender folks. "Deciding to transition takes an enormous amount of courage. It is not something that people do impulsively. It's often many years of struggling with gender dysphoria, a depression and discomfort from a body that they don't feel like is their own," Inker said. "Now I've allowed myself to be who I really am," Christine said. Hormone therapy, surgeries to look more feminine or complete sexual reassignment surgery are options during transition. "Will I ever go all the way? I don't know," she said. Christine is not sure how far into her transition she'll go. "My brain believes I am a woman. I'm a woman. And I know that's really hard when you stare at someone like myself who has all the physical body parts of a man. You say, 'How can you be a woman? Get that out of your head! Get over it.' A lot of people say that. Sorry, I can't," Christine said. "It's who I am. I can't get over this." 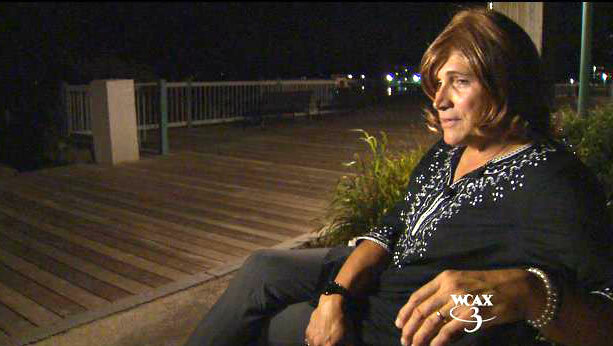 At 59, that once scared little boy is becoming the woman she hoped and prayed to be. Christine Hallquist: Now that it's no longer a secret, it's incredibly peaceful. Darren Perron: So will we see Dave Hallquist in a suit and tie again? Christine Hallquist: Unfortunately, yes. Ha. That's my costume... Do I see someday walking into the Legislature as a woman? Maybe. I'd love to see that day. Christine Hallquist has now informed her board of directors at Vermont Electric Co-op and her employees. And it's gone well. She no longer worries about losing her job. However, she is concerned about some national utility boards she sits on and whether she'll be squeezed out because she's transgender. She will send out a statewide press release Friday about her transition. And on Sunday, she will take part in Burlington's Pride Celebration as Christine.